Professor Ruth R. Wisse (pronounced WISE) takes her humor seriously, but she is lighthearted and insightful in her seriousness. Her book is a scholarly study and she is a respected scholar (professor of Yiddish Literature at Harvard University). But she makes her study into an intriguing exploration with the reader as a welcome guest. Few academes can give their academic tomes the kind of engaging relevance that Ms. Wisse’s book gives hers. Explaining a joke is usually the surefire way to kill the joke. The author uses numerous jokes as examples in her study. She explains them and then explains why she is explaining them. She presents old, folkloric versions of a story next to its modern, rewritten equivalent. Somehow, after her treatment, the joke is not only still alive, it is stronger and more enjoyable. A strong thread in Jewish humor, the book points out, is deprecation. It is often self-deprecation—laughing at flaws, imagined flaws, and stereotyped traits of the teller and the community. On the other hand, the humor is frequently a weapon, sharpened to jab at oppressors and the oppressing society that rejects the Jews. The jokes and stories that act as redress for hurts—real, imagined, and part of an ethnic, cultural memory—range from blatant to subtle. The goyim (a Hebrew word that is used to describe the entire non-Jewish world) are the subjects of the deprecation in those yarns. Apropos of explaining jokes, one of the old chestnuts that author Wisse uses—in several of its forms—as an example states that a peasant laughs three times when one tells a joke. The first laugh is when the joke is told. The second laugh comes when one explains the joke. Then the peasant laughs the final time when he understands the joke. The peasants in the Jewish experience—particularly in Poland and Russia—were often used as a willing tool of the state’s anti-Semitic agenda. 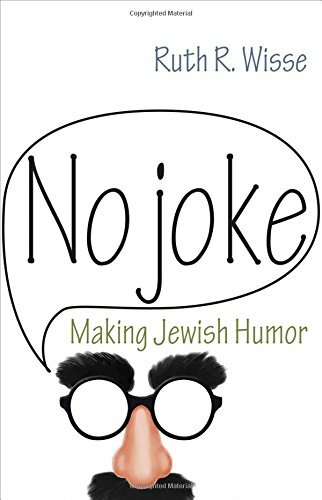 No Joke is a thought-provoking compilation of humorous stories woven almost seamlessly with history, and interpretive analysis. The author keeps it personal—sometimes moving comfortably into a relaxed and chatty tone—and she keeps it real. Even the deepest analysis is delivered as direct communication free from the weighty language one frequently finds in professorial volumes. Professor Wisse’s gaze wanders from biblical references to Sigmund Freud’s analyses of Jewish humor, to writings saved from the holocaust, to the latest trends in American Jewish wit. She draws cogent examples and appropriate quotes from her sources and weaves them together with a fine thread of perception and scholarship. This is a valuable book on an often overlooked area of literary culture.